Rocket & Rye create and manufacture design-led gifts, supplying retailers throughout the UK and beyond. Our story goes back a long way - we met at Art School and have been making things together ever since. In 2005 we started designing canvas prints for local tourist stores, and soon we were supplying retail chain stores. Under our Rocket & Rye brand we now develop our own gift ranges as well as working on other bespoke items for UK retailers. Since 2010 we have been based in Liverpool's Baltic Triangle, in an old warehouse which has been gradually taken over by our Carnival Lights! If you are a bricks and mortar retailer and interested in stocking our range please contact cathy@trans-pacific.co.uk for more details. We exhibit at Top Drawer and Spring Fair. 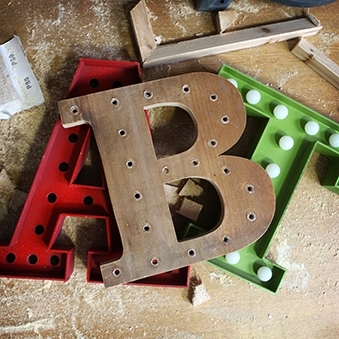 It started with a fret saw, a home made wooden letter and a light string. This is how we made our first letter light as a present for our daughter. Everyone loved it and our passion for marquee lights was born. Since then we have designed and developed a 13" range of steel linkable LED Carnival Lights in rust and industrial silver finish, and a stand alone 9" range in silver. Take a look at the Gallery to see the lights in action in our customers' homes. 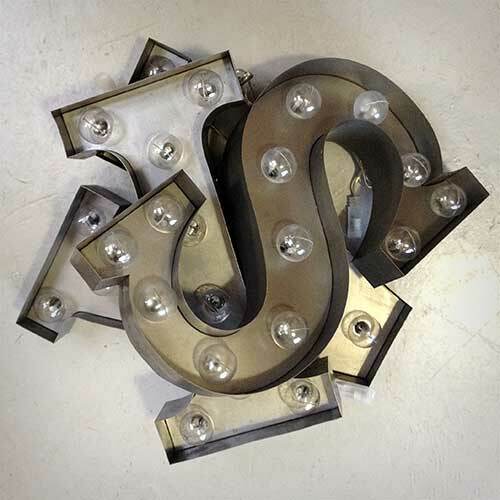 We are the exclusive supplier in the UK for Rocket & Rye Carnival Lights, our original designs are registered and we are adding more shapes to our range for 2015.